Vanessa Bell née Stephen was born on this day in 1879. A key member in the creation of the Bloomsbury aesthetic, Vanessa was a prolific worker and over the course of her life produced vast quantities of paintings, drawings, interior design and furniture decorations, woodcuts, book covers, textile and crockery designs. There is a large portion of her work in the AG Gift, spanning from her earliest days at Charleston to her death in 1961. CHA/P/606 Vanessa Bell. Sketchbook. Photograph © The Charleston Trust. Today, on the day of Vanessa Bells birthday, we are sharing works found in Charleston archives, that celebrate the legacy she left here. CHA/P/174 Recto. Vanessa Bell, The Kitchen, c.1943, painting. Photograph © The Charleston Trust. Painted from inside Charleston this image shows a young Grace Higgins, Charleston’s housekeeper (1920-70), in the kitchen preparing a meal. A basket of fresh vegetables from the garden lay in the foreground these would have been an important part of supplementing rations during wartime. With the help of Grace, Vanessa ran an orderly and welcoming household and Grace’ work meant that Vanessa could paint full time. CHA/P/2501 Recto. Vanessa Bell, print of classical scene in Rome, ink on paper. Photograph © The Charleston Trust. Vanessa’s travels are well documented in the gift and she explored France, Italy and England often in the summertime. Painted during a trip to Rome this image shows a picturesque scene of a church with sculptures that stand on plinths in front of its facade. Vanessa was inspired by both the classical architecture and art of these destinations. Many classical figures and studies are featured within sketchbooks in the gift. This colourful and modern fireplace painted between 1925 and 1930 shows Vanessa’s skill in abstracted domestic design. Proudly displaying her cross hatching and circular motif this playful piece is perhaps a quinessential example of Bloomsbury design aesthetic. Situated in Clive Bell’s study this is one of the first objects visitors view when visiting Charleston today. Of the last descendant of Bloomsbury’s ‘inner-circle’, an impressive obituary of 4th May 2012 remarks that Angelica’s parentage gave her a ‘double share of Bloomsbury inheritance.’ The only child of Vanessa Bell and Duncan Grant, Angelica Vanessa Garnett was a talented woman. Undoubtedly affected by her parents’ artistic talents and her unconventional upbringing at Charleston, Angelica’s vast resume encompassed writer, painter, performer, ceramicist and sculptor. CHA/P/1643 Angelica Garnett. Two children sat at table. Painting. Photograph © The Charleston Trust. Born at Charleston on Christmas Day of 1918 Angelica’s arrival marked the end of the war as well as the end of her parent’s sexual relationship; however, her birth tied them together in a significant way, perhaps a reason for living and working together for the remainder of their lives. Angelica grew up being doted on by her mother, though her paternal relationships were a little more complicated; growing up believing that her father, like her brothers, was Clive Bell. Angelica was informed of her true parentage at the age of 18, upon sternly being advised not to mention the subject again. Where Vanessa perhaps believed that her child had the love of two fathers, Angelica wrote that ‘in reality,’ she ‘had none’. Her widely acclaimed memoir of this period Deceived with Kindness, the experience of growing up at the centre of the Bloomsbury Group, is considered an important part of the set’s social literature. CHA/P/1642 Angelica Garnett. Woodland animals by stream. Watercolour and Pencil on Paper. Photograph © The Charleston Trust. Angelica’s legacy does not end with literature. Many of her early art works (often produced in collaboration with Vanessa) can still be viewed at Charleston, a special example displayed in the spare bedroom. Her sketchbooks also form part of Charleston’s archive, containing fashion design, pattern design and still lives. Recognising and promoting Charleston as a place of significant artistic heritage, Angelica and her brother Quentin’s gift of the house to the Trust along with their tireless work during its period of restoration in the 1980s was instrumental in securing a future for Charleston post-Bloomsbury. CHA/P/2437 /21 Angelica Garnett. Waistcoat design. Pencil on Paper. Photograph © The Charleston Trust. Aside from the estate, perhaps Angelica’s biggest legacy is the Angelica Garnett Gift, a collection of over 8000 works on paper and canvas. The pieces, mainly works by her parents, had previously filled the drawers, cupboards and studios at Charleston. After Duncan Grant’s death they were held in London at an art storage facility and were largely unseen for nearly 30 years. In 2008 these works were gifted to The Trust, and the exciting work of discovery began. Previously unpublished, this inspiring collection teaches us about the artistic practices and evolution of two internationally acclaimed artists. CHA/P/2437/5 Angelica Garnett. Domestic pattern, red and blue crown with green leaves. Photograph © The Charleston Trust. The Gift continues to encourage new insights into Bloomsbury’s creative processes and engages us (the attic interns) in the museum documentation processes of cataloguing, digitalizing, conservation and research. Angelica’s gift to Charleston was generous and significant; with it she leaves an important legacy, one that celebrates her family, their work and more intimately, their lives. CHA/P/2436/17 Angelica Garnett. Moored boats by trees and houses. Watercolour on Paper. Photograph © The Charleston Trust. An inscription featured on the verso of this object allows us a glimpse into what its image might conceal. The address of Omega Workshops Ltd. ‘33 Fitzroy Square’ is inscribed on the paper. This firm, which was directors’ Roger Fry, Duncan Grant and Vanessa Bells’ first experiment in commercial domestic design, was in a way a patronage of their recognisably bold modernist design aesthetic. With roots in many aspects of the Arts and Crafts movement, which developed at the end of the 19th century, Omega, established in 1913, sought to remove perceived divisions between the decorative and fine arts. Designing and producing furniture, textiles, painted murals and household goods; the Omega Workshops became a method through which Fry could employ and encourage artistic work from many of his friends and acquaintances. The aesthetic of Omega was largely Post-Impressionist, however numerous other influences become apparent when studying the breadth of work produced in their short period of trading. CHA/P/2622. Omega pattern design. Gouache on graph paper. Recto. Photograph © The Charleston Trust. Standing alone, as a piece of art usually must, the design is modern, geometric and angular in composition. Its circles, arranged in context like cogs revolving in a mechanical engine seem an influence at odds with the arts and crafts ethos, one of Vorticist and Cubo-Futurist movements of the period. These sought to capture speed and energy with an interest in the mechanics and dynamics of the modern age. A couple of words scattered on the back of the piece craft a complex history of its authorship; these read ‘Not by VB. Fry?’. Inscribed in pencil as lightly as the comment is unsure of itself, they are markings of a number of possible viewers. We know Grant signed many works retrospectively in the 1960s (sometimes even signing the work of others, often attributing work to ‘VB’), both for exhibition and sale. Previous to the Angelica Garnett collection being gifted to Charleston, others would have had access to the works so this inscription could have been penned by a viewer after Grant’s death. The letters on the recto of the image (written contemporaneously) seem to spell ‘soiree’ which could be the authors title for the piece, and below a three letter initial which matches none of the known members’ signatures. According to the inscriptions on the verso, the latter authority must have agreed, and attributes the image (uncertainly) to Roger Fry. CHA/P/2622. Blank page with inscriptions; ‘Not by VB. 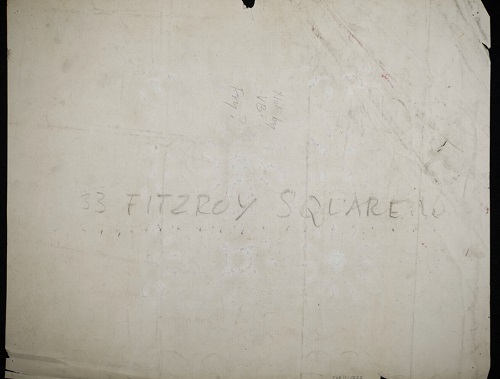 Fry?’ and ’33 Fitzroy Square’. Verso. Photograph © The Charleston Trust. The design is painted in gouache on graph paper; the squared canvas allowing for precise straight lines and calculated geometric pattern. Additionally, this material could have been used to accommodate a better translation into a rug, cushion or textile design. Omega artists produced patterns and these unusual designs had to be translated, often creatively, by manufacturers. Omega rug designs were thought to be manufactured by English firm ‘The Royal Wilton Carpet Factory’ who opened a London office in 1913. To ensure products were bought for their aesthetic appeal and quality, and not for the reputation of the artist or designer, works were not signed individually. Works were marked only by the letter ‘Ω’. This could be why the design appears not to be signed by any known Omega textile artist. It is possible that this piece was created by Frederick Etchells, painter and founding member of the Omega workshops, following that many of his works on canvas were highly geometrical in style. In 1913, during production of works for Omega, Etchells worked closely and in collaboration with Duncan Grant in Grant’s London studio. Etchells decision to leave the guild at the end of that year was followed by his joining Wyndham Lewis’ Vorticists, a group that were in opposition to Omega. Though Etchells soon gave up painting and became a successful architect, this preliminary work certainly shows a sense of the architectural, featuring blocks built on top of one another with relief-like circular and square forms structured into the image. Although the written signature is missing here; the signing ultimately is in the work, where paint and painter combine to produce a corporeal object and image standing in for the body and then name of the painter. 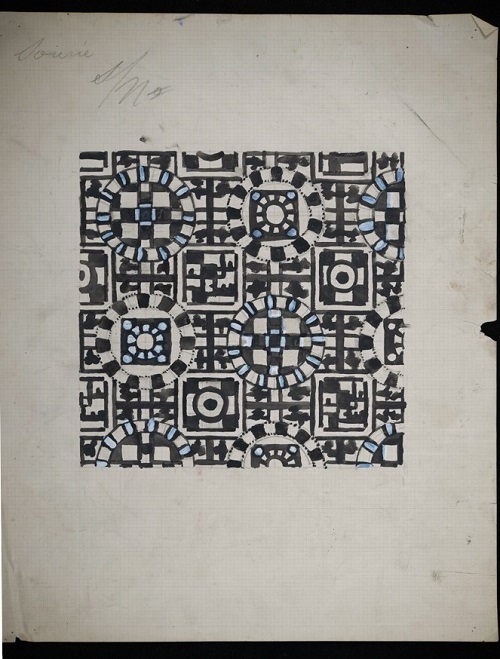 We can only speculate as to who the author is but this preliminary design for a textile shows a vision for domestic design that remains modern 100 years after its production.